Buenos Aires - Argentina, Uruguay and Paraguay will form a joint bid to host the centenary World Cup in 2030, the presidents of the three countries confirmed on Wednesday. Paraguayan President Horacio Cartes had said in August that his country would join the shared bid by neighbours Argentina and Uruguay, which hosted and won the inaugural World Cup in 1930. Cartes met with his Argentine and Uruguayan counterparts, Mauricio Macri and Tabare Vazquez, in Buenos Aires on Wednesday to finalise the announcement. "The first meeting (for the bid preparation) will be organised in the first week of November," Cartes said. "Other countries are going to want to host but there is a very strong argument in favour of Uruguay, which will celebrate 100 years" since it staged the first World Cup. 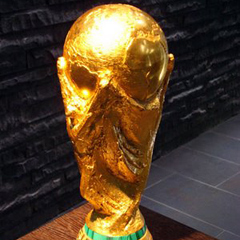 South America last hosted the World Cup in Brazil in 2014. Any bid for 2030 is likely to face stiff competition from the Asia region, where China is expected to be the front-runner to stage the finals. A joint United States-Mexico-Canada bid is the favourite to host the 2026 tournament, with only one other country, Morocco, having entered the bidding race.